Why is there so much noise in my vehicle? There are several reasons why the noise level in a vehicle might be high. In some automobiles, the manufacturer just didn't add enough noise control material, leading to higher noise levels in the vehicle. In older cars, your exhaust system or muffler might be at fault causing extra noise inside the automobile. 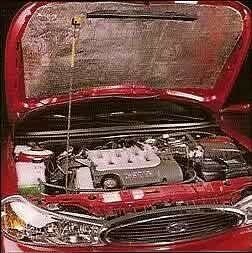 In some cases, people will modify their engine or exhaust system, and they will cause the noise themselves. And finally, the tires that you have installed on your vehicle may be adding to the noise inside your vehicle. All of these problems can be addressed to reduce the noise level inside your car, truck, van or SUV. So what can be done about the noise? Once you have determined that the noise is a problem inside your automobile, you can start to identify what should be done to reduce the noise. First of all, if there are any mechanical problems with your engine, exhaust system or muffler, those problems should be addressed. Covering up the symptoms of mechanical problems is never a good idea. If there is a problem with your exhaust system or muffler, you could have exhaust fumes leaking into the passenger area. This problem should not be ignored or covered! If your tires are causing the noise inside of your vehicle, you can obviously replace them with a better set. This of course can get expensive and if you have recently installed the tires, would be a waste of a good set of tires. The best way to reduce the noise inside your vehicle is to use a product such as Dynamat, Hushmat or STP Silver to cover the entire inside of your automobile. This will require removing the seats, carpet and door panels to cover the entire inside of the body. These products are typically made of Butyl Rubber, and are installed by peeling and sticking the material directly to the sheet metal of the floor, doors or any other desierd surface. As an alternative for those with a lower budget, you can buy a foil faced, heat and sound insulation that will work as a padding for under your carpet (Here is an example Heat/Sound Insulation). Most of your noise should be coming from the road and the firewall, so those will be the most important places to insulate. This will require only removing the seats and carpet, and will be a little easier to install than Dynamat. This insulation can be laid on the floor with the foil side up, and the carpet can be installed over it. The insulation will not only reduce the noise level coming from the road, but also reduce heat as well. Once you have addressed any mechanical problems, and added the sound insulation, your noise problems should be under control. Having a quiet vehicle will improve your driving experience and help you to enjoy your automobile for years to come!